Napa Nuts is pleased to announce that we are offering a new product line that screams "Wine Country." Wine RayZyns® are a superfood snack that is great on its own or as an ingredient in something delicious. RayZyns® require a special drying process; they naturally sweat out the water of the fruit and use the residual natural sugars to caramelize and toast the wine grape’s seed inside the fruit, thus creating a new CRUNCHY superfood fruit. By leaving the seeds inside the fruit, RayZyns® provide 20% of your daily fiber in a single serving, more antioxidants than a glass of red wine, and a delicious nutty crunch that will help fight hunger while delivering unprecedented nutrition. Each natural RayZyn® product has only 1 ingredient--the grape itself…no added sugar, sulfur or preserves…its just nature in a bag. Here at the shop we have enjoyed them in our new custom-made Valley RayZyn Blend Trail Mix, on salads and in cookies, but the possibilities are endless. 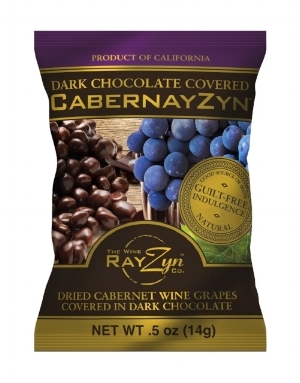 Wine RayZyns® comes in 4 varieties: CabernayZyns®, made from dark purple Cabernet grapes, the ChardonayZyns® from the lighter Chardonnay grapes, MerlayZyns®, made from the smooth-tasting Merlot grapes, and, as if it couldn't get any better, there is also a Dark Chocolate Covered CabernayZyns®. Napa Nuts is offering all of Wine RayZyns® products in bulk and each of the packaging options as well. Check out all of the options on our Wine RayZyns® page. It has been a lot of fun to part of the start of such a fun, and versatile new opportunity. We are sure that everyone will enjoy the sweetness, crunch, and flavor complexity. Read more about the Wine RayZyn® Company here.